Wow, it's been four weeks since I've put up a blog post! Same old excuse. Really busy. I have been running though! A few highlights from my last weeks of running. Since it's been so long it's not a picture of the week! This isn't a running picture, but it's one of my favorite pictures I took all month. This is my mare Sasha patiently waiting for me to hang turn ribbons at an intersection of trail. Ran 44 miles total, so I got all my runs in. My 5 mile tempo run turned into a 7 mile tempo run because it was a cool day and I just kept running. My long run (12 miles) and a 6 mile easy run were on trail. 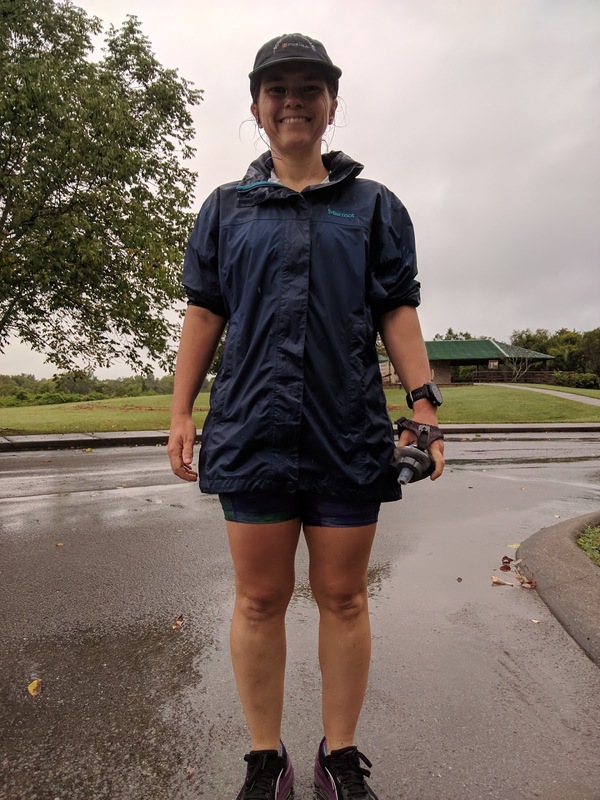 Only one treadmill run this week and a 3 x 2 mile tempo run in the rain wrapped up my week. 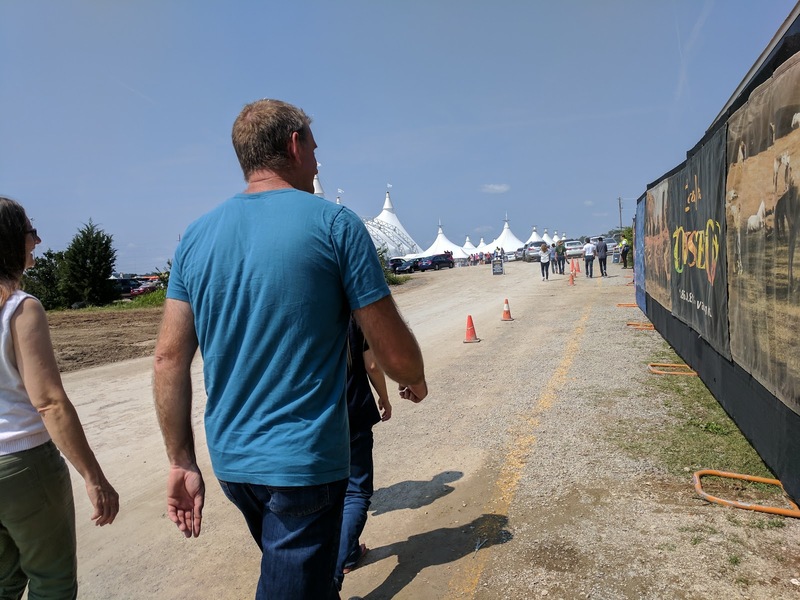 Walking from our truck to the show! This was such a great week for me personally. Maybe not so great for running mileage, though! On Sunday, several of my family got to see Cavalia in Nashville. It was such a great show! We had a wonderful lunch at Romano's Macaroni Grill before and some ice cream after. Wonderful horses, amazing acrobats, good food and some of my favorite family to spend it with??? Absolutely wonderful! Monday, I went to run the Franklin Classic 10k. I usually run the 10k AND the 5k, but this year, for some unknown reason, the 5k was starting an hour later than usual. I run slow enough that, in previous years, running the 10k gave me about 10-15 minutes to change my racing bib before the 5k started. They also removed packet pickup on Friday, so I had to go early on race day to get my t-shirt and race bibs. The t-shirt I got was ginormous! So huge! Supposed to be a medium, but it's so huge, I think Daniel can wear it. All in all, a not so pleasant experience with the "extras" of a race. 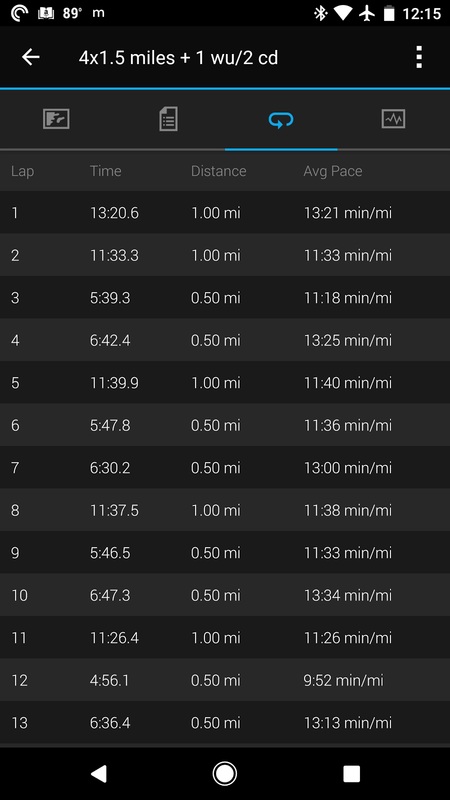 My plan was to run my own warm-up, then run the 10k at my half marathon tempo pace, since Monday is Tempo day for me. I ran a 2 mile warm-up by running up to Pinkerton Park and through their paved trails before running back to the start line. I seeded myself much further up in the pack than I usually do. I have a tendency to seed too far back these days and get stuck behind walkers and strollers. I ended up a little too close to the front, but I tucked myself into the far right lane and let people flow around me until I was running the same speed as the people around me. One of these days, I'll figure it out. My target pace was 11:50/mi, give or take. My first mile was 11:03. Oops. Slow it down. I managed to slow to 11:24 for the second mile, but began passing people already who went out way too fast the first mile. I was too fast my first mile also, but I was by no means used up. My 3rd mile had a couple small hills in it and I just motored up the hills, passing more people while they walked up hill and even more people as I cruised down the other side. 11:13 for the third mile. By the fourth mile, I was running with people who were still holding their pace or had slowed down to their pace and I didn't pass many people in that mile. 11:22 for that mile. Mile 5 had some mild downhill and I used that to my advantage to do an 11:15 mile. I had pretty much abandoned the idea of running 11:50/mi! I was running well, my breathing was fine. On the flat, I was running around my tempo pace. On the up hill, I was only a few seconds slower and on the downhill a good deal faster. My HR was only a bit higher than a normal tempo run. So while I was running faster than I planned, my body felt ready for it, so I made the decision to just keep going. 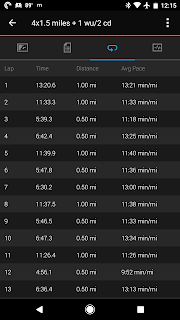 I was pretty sure I wasn't going to PR, but I let myself run a bit faster on the 6th mile for 10:50, again using downhill to my advantage and passing a few people in this mile. After the 6th mile, I let go and sprinted the finish for an average of 8:13 for that last quarter mile. And came in just under 1:10. A PR! When I was going to just go do a tempo run. Haha. 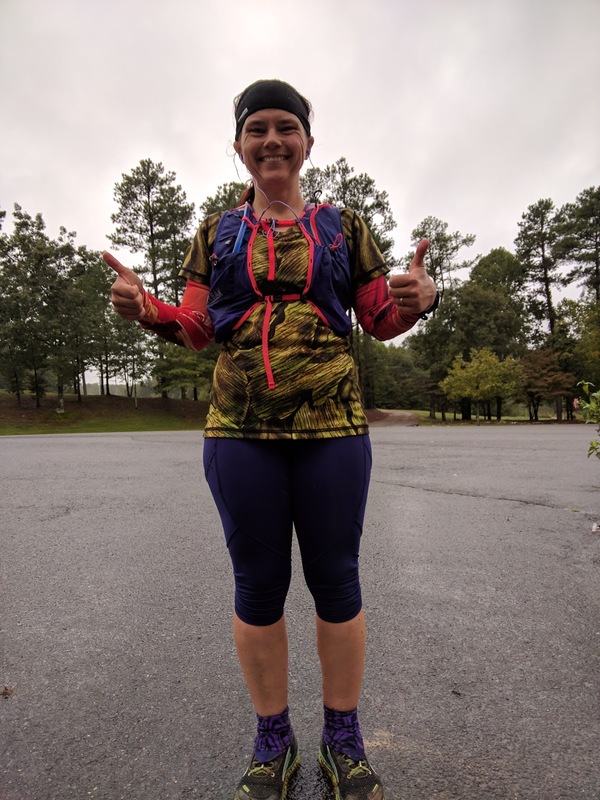 I kept running and retraced my warm up for a cool down at an easy pace, reliving the race and deciding that while I had PRed, I hadn't run too fast. I felt good and my HR recovered very quickly. On Tuesday, we left for vacation at the annual Big South Fork endurance ride. Daniel takes care of the water and I volunteer to mark trail. 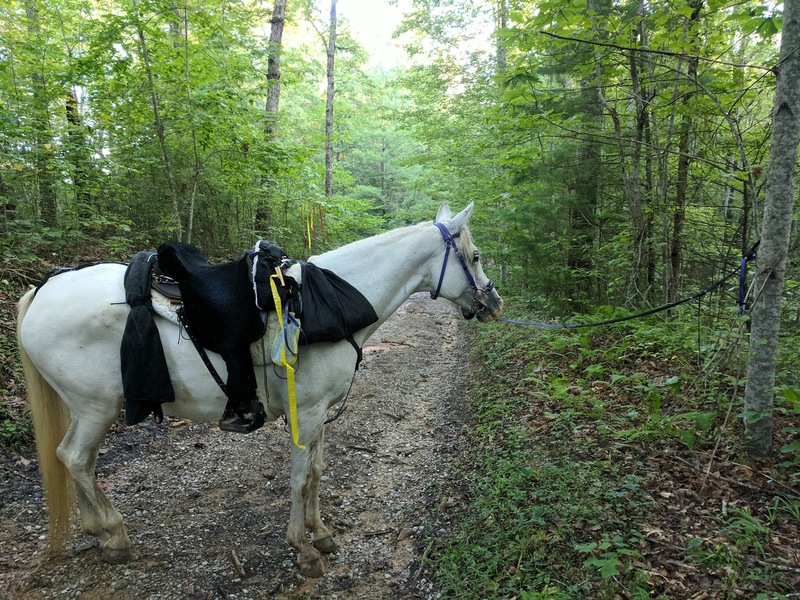 This means a lot of time on my horse, Sasha, putting out ribbons on trees for the riders to follow to keep them on trail. Since I spend a lot of miles, Sasha and I don't get to compete this ride. We just volunteer. Tuesday it rained and rained and rained after we got parked. We decided not to do any trail marking that day and I decided to hang out with my friends and go to supper rather than go for a run in the rain. So it ended up a pure rest day. Wednesday, I got up and did an easy 6 miles on the gravel road that bisected our endurance camp before starting my trail marking duties. My view for many miles and hours from the back of Sasha. Over the next 5 days I spent 105+ miles on horseback. 41 miles on Sasha marking trail, 16 miles unmarking trail, and 50 miles on Friday doing the endurance ride on a friend's mare. 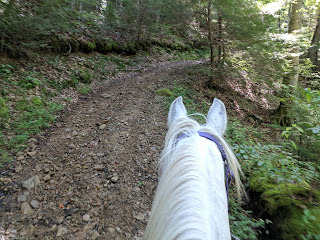 Diane knew I couldn't compete Sasha because of marking the trail, so she graciously offered me Sunshine to ride! I couldn't resist and was completely grateful for the opportunity! Sunshine was a good horse, taking the hills in stride and carried me to a 10th place finish on a tough trail! So while I only ran 16 miles during week 13, I rode 91 miles on horseback. If you've never done an endurance ride before, trust me, that works the legs! Me after a cold long run! Back to my regular schedule! I rode Sasha 16 miles on Sunday pulling ribbons I'd put up before the endurance ride, but after that, it was back to the pavement or trail for running. My Monday tempo run was tough on sore and tired legs! But I managed to keep to pace and did my entire 6 miles. Back to Bowie Nature Park for my 12.5 mile long run on muddy trails in drizzling rain, a couple of easy runs on the treadmill and a repeat of my 3 x 2 mile strength run rounded out my 44 mile week. Finally up to the current week! I did a couple of easy boring 6 mile treadmill runs on Tuesday and Thursday. I really need to get another 6 mile program. I'm bored with the one I have. My adorable 22 week old kittens. 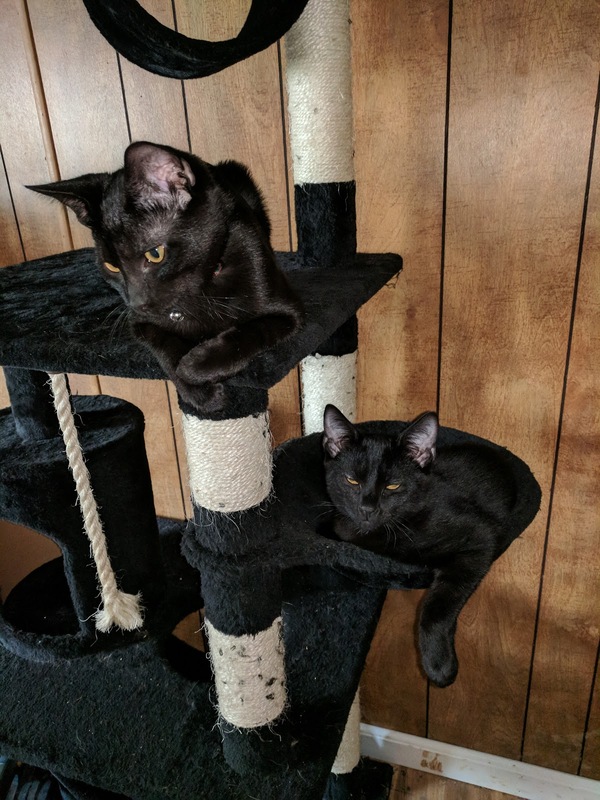 Coltrane up top and Snowball below. Wednesday was my long run. I had to drop off my kittens to get neutered, so I ran around Franklin for 11 miles. I had a course all mapped out and loaded onto my 935. First issue, it was really hot and I forgot my handheld water bottle at the truck. I didn't realize until I was almost 2 miles into the run (when I wanted that first drink...) and I wasn't going to go back to get it. I knew I could get water along my route, but I had thought I'd use that for refilling, not for the entire water for my run. Second issue, my 935 crashed during the course, so I had to reset it. Fortunately, the watch didn't lose the first part of my run. So I canceled the course and continued running. Unfortunately, I didn't realize that the GPS didn't lock on! So I ran almost a half mile before it beeped and said it found the GPS signal. Ugh. So I lost 1/2 mile. Of course that half mile is not counted in my weekly total since I have no proof! Not the end of the world, but annoying. Third issue, I twisted my left ankle pretty badly while trying to walk along the side of a busy road without a shoulder or a sidewalk. That was not fun. I had to walk for about 1/3 of a mile before I felt I could jog on it. It was ok, but still hurt a bit the rest of the run and I had to ice it for the next 2 days (although I did do my other runs on it). Fourth issue! I had mapped out a course that included no sidewalk for over a mile! Where I twisted my ankle, I knew had no sidewalk, but it was only a short stretch and I was ok with that. But I thought there was sidewalk on the rest of the course. Nope. So I had to walk close to the busy road, but in the grass and uneven terrain with a twisted ankle. Really brought my average pace down. This was a slight downhill and should have been a joy to run. But there were not any convenient back roads that I could use to cut through. I breathed a sigh of relief when I got back to the sidewalk! All in all, it was an...ok...run. I got it done. It was supposed to be a 10 mile run, but was 11 (really 11.5...). And it was well within my long run pace range. Since it was a one-time thing, I don't have to figure out how to fix the course. I'll just let it go. I run to eat!!! Post long run meal! 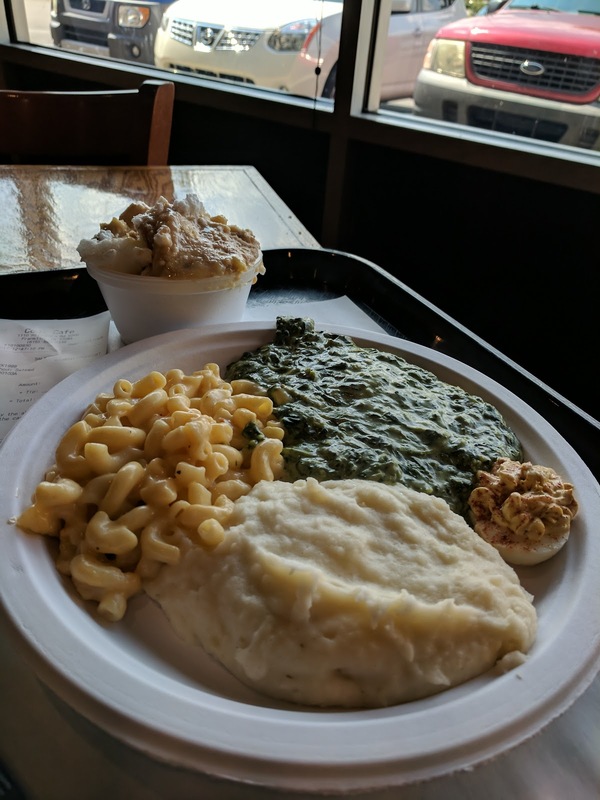 After my run, I cleaned up with no rinse bath wipes and no rinse shampoo and found a local eatery to work while I waited for the kittens to be ready to come home. Friday was another strength run. 4 x 1.5 miles with a 1/2 mile recovery. I did a 1 mile warm up and 2 miles cool down. This was a good run. I took a bit to settle into my breathing, but I hit my paces pretty well and felt pretty good. 42 more miles in the books. More running, but I'm getting closer! My half marathon is on October 15. I have 4 extra days in my training cycle. I do not want to just add 4 days of easy running to my taper, so I need to figure out where to put them before the taper and what workouts to do.